At least 73 supermarkets will have to be sold in order for Sainsbury's proposed merger with Asda to be given the go-ahead, according to new research. And it's in the south-east and the north-west of England where stores are most under threat. The new supermarket group would become the largest in the UK by market share. The £15bn deal is set to face huge scrutiny by the Competition and Markets Authority (CMA). regulator. It's the CMA's job to prevent companies becoming too dominant and harmful to consumers. If the CMA approves this merger, then many expect both chains to have to give up a number of stores. However, divining how the Competition and Markets Authority will vet this controversial mega-merger is no straightforward task. "There hasn't been a retail deal like this in more than a decade," says David Haywood, founder of Maximise UK, which is an expert in identifying the best locations for stores. He reckons at least 6% or 73 of the combined group's supermarkets are at risk, a figure that excludes convenience stores. Mr Haywood worked on the last big retail merger - the takeover of Safeway by Morrisons in 2004. The market looks very different today, with the rise of the discounters and the ability to buy groceries online. So how will the CMA view this blockbuster merger? 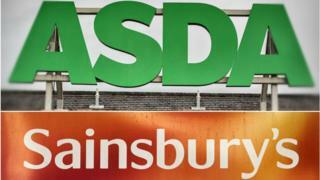 "The real focus will be on how Sainsbury's and Asda's main supermarkets operate at a local level and how they overlap. The CMA will be concerned about whether the deal reduces the number of competing brands within a 10 or 15 minute drive time," says Mr Haywood. One of the key questions is what weight the CMA gives to Aldi and Lidl, which have grabbed more than 12% of the grocery market and are continuing to open lots of stores. Maximise UK's calculations do include Aldi and Lidl as effective competitor brands. But it says if the CMA takes a more conservative view and excludes the discounters, then the number of potential store disposals leaps to 245, a number that would weaken the financial merits of the tie-up. The CMA has included Aldi and Lidl in a number of previous cases, although they've been given a lower "weighting" in some investigations because they didn't stock all of the products of their competitors. Sainsbury's is confident that the regulators will take a more sophisticated approach this time round reflecting the changes in how and where people shop. It also believes there are aren't as many overlaps as critics may think because its stores are mainly in the South East while Asda is a major player in the North. And both chains will no doubt be emboldened by the recent CMA decision to approve the takeover of the wholesaler, Booker, by Tesco. Sainsbury's chief executive, Mike Coupe, has insisted there won't be any store closures as a result of the merger, and that any stores that needed to be off-loaded would be sold as trading entities. But who would take that space? "For me this is the real issue regarding these overlapping catchment areas," says Mr Haywood. "Considering that 66% of the stores caught in the overlap analysis have selling areas over 20,000 sq ft, the key issue is who can actually acquire store locations of this size. They're typically too big for an Aldi or a Lidl." One thing's for sure - there won't be a conclusion to the CMA's expected investigation anytime soon. It could take a year, a long time for thousands of workers who may be feeling vulnerable about the future of their stores and jobs.